Weeds are simply plants that we do not want in our farms and gardens. 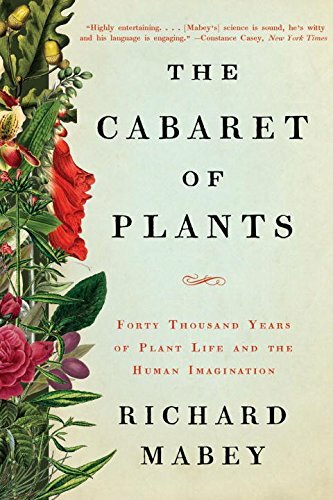 Botanically there is no such thing as a weed, because a plant becomes a weed when we do not want it to be in the place that it is. In the wilderness there are no weeds, for humans and their artifices are absent. 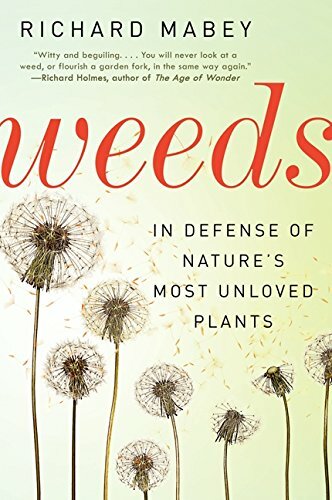 Furthermore, poisonous plants are not weeds per se. For example, foxglove is grown for its beauty, but it contains digitalis, a heart poison, and aconite is beautiful but deadly poisonous. Moreover, there are weeds that are minor nuisances, while others are major problems for gardeners and farmers. But some are edible, even very nutritious.I am concentrating on weeds that affect gardeners, householders and walkers. The Apiaceae, the plant family that gives us carrots, parsnips and parsley, among other staple foods, also contains some horrors. Let me list them: hemlock, hemlock water dropwort, fools' parsley and giant hogweed,and this list is not exhaustive. Heracleum montegazzianum, the giant hogweed, looks pretty, with its foam of white flowers that lure the unsuspecting to draw closer. As the plant looms over you, as it can grow very tall, you might be tempted to pull off a sprig to take home, and then your problems begin. The sap is phytotoxic, and once on your skin it reacts with sunlight to produce a very nasty rash, a painful reddening of the skin that produces an powerful urge to scratch. And you dare not get it in your eyes! The skin needs protection from light for at least several days, if you are lucky, and some think that it might produce lifelong damage.The British and the US authorities are as one on this matter, for they both insist that you are not allowed to plant this weed in your gardens, and in the USA you cannot transport it over state boundaries.Many gardeners, farmers and countryside managers simply destroy the stuff. To be brutally honest, as a grandfather who would like to take his grandchildren walking, I don't want this weed around and am happy that it be eradicated.The plant often grows on riverbanks, so you need to take especial care when walking in such places. We do not have poison ivy growing in Britain. This plant is in the genus Toxicodendron, whereas our native ivy is in the genus Hedera. We don't normally count ivy as a weed, it is simply part of the landscape, but tree growers might think it a weed sometimes. There are others that are environmentally destructive, and I am thinking of Japanese knotweed and Himalayan Balsam. 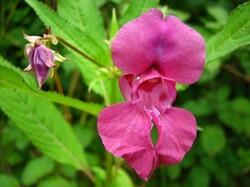 I saw a mass of Himalayan balsam while taking a Sunday walk with my wife Maureen. We were strolling down the embankments in the Mersey Valley, but part of our walk took us along the banks of a small stream, which were becoming smothered with the purple flowers of this invasive weed. It is a beauty, never say that weeds are ugly, but it clogs up water courses. Introduced by Victorian plant hunters in the nineteenth century, it has naturalized too well and the blockages that it causes disrupt water flow in places and smother native riverbank flora. Gardeners have several persistent foes, one of which is creeping buttercup, and this weed has been a problem for me. The trouble is that I make paths out of wood chip, and creeping buttercup seems to find this the equivalent of a five star hotel. But it is not just the fault of the paths, because creeping buttercup enjoys damp conditions and slightly acidic soil. My soil is pH 6.5, hence slightly acidic, and I live in North West England, known for its damp climate. The plant also spreads through a network of fibrous roots,so when you dig it up you have a root network to contend with; and it is tough, I have used pelargonic acid on it, [a really powerful weedkiller], but it takes a few doses to finish the weed off. Answer, the problem is in the paths, so in Winter when the plants have died down, I am excavating the wood chip and laying down a path of weed control fabric. Successful weeds differ from most wildflowers in that they flourish on rich soil. That is why the thrive in gardens, taking advantage of the gardeners' hard work in fertilizing the soil. Look at nettles, for instance, they thrive on or near the compost heap, making use of the richness that I am creating. But that's their downfall, for I chop them down and return them to the heap that they have been plundering.However, not before the butterflies have had their share, for butterflies like nettles, on which they lay eggs and on which their caterpillars grow. The Red Admiral, Small Tortoiseshell and the comma are great lovers of nettles. Nettles, though, are deep rooted and draw up nutrients from the subsoil, so they are a mixed blessing to gardeners, for they can be added to the compost heap, supplying it with the nutrients that thy have drawn up from deep. Some people get annoyed by dandelions, but though they need to be kept under control, I don't hate them. For dandelions and dock leaves I use the garden claw to extract the long tap root. Dandelions and dock spread by seeds I am far more annoyed with ground elder, which spreads wildly and cannot be eradicated. You just have to keep on fighting it. It was introduced by the Romans as a salad vegetable, and while they went long ago, the ground elder stayed . If left untended it can carpet the ground very quickly, and it likes moist conditions, such as we get in North West England. But you can eat them. Well,often! People are sometimes surprised that I have eaten nettles. But there is a knack to it. Pick the young leaves from the top of the plant and throw them into a soup or stew as it is boiling. The heat destroys the sting, but not the salty flavour. Nettles are rammed full of nutrients, and that is why they need a sting, as otherwise they would be so attractive to eat that they would soon be extincted. Some connoisseurs use dried and shredded nettle leaves as an alternative to salt. Avoid older leaves as they are bitter with oxalic acid. There are other weeds that make a good contribution to a salad. My foe,ground elder, was introduced as a salad herb and was widely consumed until parsley took over a couple of hundred years ago. It does taste somewhat like parsley. There are two others that are useful ingredients of a salad, these being fat hen and good king Henry, both closely related species that can serve as a substitute for spinach. Fat hen does not grow where I live, but good king Henry does, and I found it quite palatable. I have found that good king Henry is common in hedgerows, so it is easy to forage. Other common garden weeds are edible. Dandelion is a nutritious food, whose leaves and flower are eaten in salads, and whose root is also edible. The stem is not considered edible. Similarly chickweed, this frail plant with tiny star shaped flowers is often found growing in gardens, and fried for two or three minutes it is said to be tasty. Dock is a relation of cabbage, but that's where the similarity ends. It is famine food, for it takes long a-boiling. I ate it once in stew and am in no hurry to take it again.When I kept chickens I supplemented their feed with dock seeds, and they ate enthusiastically. 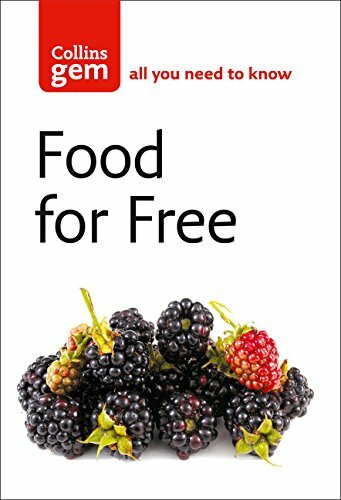 Getting a good book on foraging, such as Food for Free, by Richard Mabey, or Food from the Wild, by Ian Burrows,will show you many edible weeds, not only in your gardens, but also in the countryside at large. That's good, Candy. I note that your grandmother, who obviously knew what she was doing, did not eat the stem, which confirms that it may not be edible. I do like Italian cooking! As my memory serves (about 60 years ago), she sauteed the flower and I do remember some leaves. My grandmother was born in Italy, so most things were cooked one way or another with olive oil and garlic! In Victorian times the poor sometime earned a living digging up dandelion roots to sell to producers of dandelion coffee. The leaves and the yellow head can be used in salads. There is an issue about the stem, for almost all plants with a milky sap are inedible. Some say that dandelion is the exception, but others disagree. I have always played safe on this matter and not eaten the stem. If you make dandelion wine, be careful of the side effect. The dandelion contains a substance that facilitates urination, which can be a useful medical aid. One glass is fine, but if you have two or more, be prepared to go to the toilet. I remember an ex sister of law of mine and I picking dandelions to make dandelion wine round about 1973. I am sure they have nutritional qualities. Thanks for this, Candy, as this is the first time that I have hard of sauteed dandelion. Which bits did she use? My grandmother pulled up dandelions from everywhere. Sometimes we had to stop the car so she could get out to pick them. We had them in salads or sauteed. I have not heard of him, so his reputation did not reach England, and having researched him, I have no information that he ever visited this country. I was unaware that humans can eat some bark, but deer certainly can and do. Some people, though, make wine from the sap of birch trees. It is a white wine and said to taste good, though I have never drunk it. 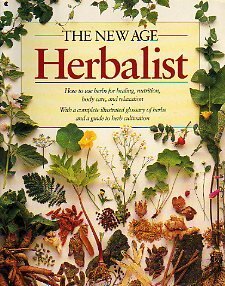 I recall a person years ago named Yule Gibbons, who became famous promoting eating from nature, including edible plants and some tree bark. He was often mentioned on television. I do not know if his reputation for eating plants mad it to England.